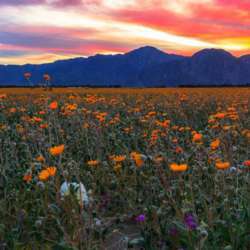 Thousands of visitors come to Anza-Borrego Desert State Park each year to enjoy the beauty of unique and captivating desert wildflowers in bloom. With 92 different plant families, Protected content and hundreds of flowering species, there is quite the variety of flora to discover! There are a variety of easy hikes to choose from, and during this time of year it will not be too hot! Please pack a lunch, water, sunscreen, and your camera! The park is about a 90-minute drive east of Escondido. To anyone interested in carpooling, I propose we meet at Von's in Escondido Protected content Valley Pkwy, Escondido, CA Protected content 8:30 am. Please note that parking at Anza Borrego is $10.